The .30-06 is one of the most popular big-game hunting rounds in the world. Originally introduced to the U.S. military, it has become the favorite round for hunters on every continent for it’s power, flexibility, and price. In the more than 100 years since it’s inception there have been significant improvements made to this round, making it even more effective. In this article we’re taking a look at the top 5 30-06 cartridges on the market. Let’s take a look at some of the best .30-06 rounds for deer hunting. These rounds offer plenty of weight and power for even the largest buck. Manufactured by the Barnes VOR-TX company, the VOR-TX Triple Shock is a polymer-tipped, copper (lead free) round. The polymer tip gives this round incredible accuracy and the nearly 100% weight retention generates excellent penetration and tissue damage. Copper is less likely than lead to break apart so ensuring damage all the way through the target to the exit wound. Moreover, the casing is made of brass. The brass construction ensures that it stays rust-resistant when in contact with rain and moisture, which further contributes to its durability. So, why is it important for the casing to remain corrosion-free? It is solely because it is reloadable where the primers can be removed and replaced easily, with just a simple pin punch. The tipped triple-shock x (TTSX) bullets are designed for excellent accuracy and weight retention, deep penetration and rapid expansion. The ideal combination of expansion and penetration upon entering the target is widely important, especially when you’re targeting large or medium sized games. Why is that so? It is because they need enough power to penetrate through the animal’s thick hide and skin in order to reach the essential organs, to deliver a devastating blow. The muzzle energy measures 2939 foot pounds (ft lbs) meanwhile the muzzle velocity measures 2970 feet per second. If you’re wondering, the theory is rather straightforward where the heavier the bullet (weight affects recoil as well), the higher the energy and velocity therefore leading to a more devastating blow. Apart from that, the main purposes of this ammunition are for deer hunting as well as match shooting. Weighing 150 grain, the TTSX rounds feature a polymer tipped bullet with solid copper construction to provide deeper penetration with great weight retention, compared to the lead-core bullets. That being said, the polymer-tipped projectile ensures the hollow point bullet expands at a quick rate. Speaking of the expansion, they are designed to expand into four sharp-edged copper petals when in contact with the target hence destroying tissues, bones and organs for a quick and humane kill. In addition to that, the polymer tip functions to improve the ballistic coefficient, thereby reducing the drag as well as increasing the bullet performance. Also, it features multiple, precisely engineered grooves that reduce pressure, hence contributing to higher velocities. First and foremost, this ammo is manufactured by the one and only Nosler brand. Just so you know, Nosler is one of the most famous rifle ammunition brands, in the market. Why is that so? Firstly, they are very experienced in the bullet industry. In fact, many gun enthusiast and shooters turn to Nosler if they plan on hunting games. There are 20 rounds included per box, upon the purchase of the product. These 20 rounds on the other hand are arranged in trays, in an organized manner to ensure easy handling and removing of the rounds as well as the compact shape contributes to simple portability, for your added convenience. Moreover, the casing is made out of brass. The brass construction ensures that it is corrosion-free at all times, so it can withstand being exposed to moisture and rain. In other words, you can utilize them outdoors, under any weather conditions. The primer style on the other hand is the boxer-primed style. For your information, this type of primers are widely used/popular in the United States. The boxer primers basically ensures that the cartridge is reloadable. In other words, the old primers can be removed and replaced with the new ones, once they are used up. Just so you know, primers function to ignite the powder charge, before you fire your shot. In terms of bullet performance, it exits the muzzle and travels at a speed measuring 2800 fps, together with muzzle energy measuring 2871 ft lbs. The muzzle velocity and energy plays an important role in the penetration where they are directional proportional to each other. So, it’s really important to get high speed loads when dealing with larger animals. Weighing 165 grains, this product is of the Accubond Polymer Tip type. The specialty of the Accubond rounds are that, they are equipped with a copper-alloy jacket, paired with the unique lead-alloy core. As a result of that, it has deep penetration as well as great weight retention, without the occurrence of extensive barrel fouling. In addition to that, the polymer tip ensures great accuracy since it allows for smooth chambering and not to mention, eliminates tip damage during the recoil of your rifle. They resists deforming and initiates expansion upon impact. Also, the solid base at the rear acts as a platform to produce large diameter mushrooms. This load is no doubt, an ideal hunting round. In fact, Hornady is a rather renowned brand in all types of ammunition. That being said, they are mainly utilized for hunting medium sized games such as deer and elks. Now, stay tuned for its additional features that makes it a great hunting load overall. First things first, they weigh 150 grain altogether, which is rather sufficient. By sufficient, I mean that the weight is suitable for its purpose, deer hunting. So, why is the weight important? Or let me rephrase, why can’t you use rounds with bullet weight less than 90 grain? This is solely because the heavier bullet will automatically increase its muzzle velocity and energy hence producing a more devastating results. The bullet should have enough power to penetrate through the hide and skin of the game, in order to reach their vital organs hence delivering a quick and humane kill. Therefore, it should be able to have deep penetration however not until over-penetration. This is because over-penetration is extremely dangerous because it might lead to collateral damage in the end. Speaking about the bullet performance, it goes out of the muzzle and flies at a speed of 3080 feet per second (fps) and has a muzzle energy measuring 3159 foot pounds (ft lbs). In addition to that, it is brass cased and boxer-primed hence leading to its non-corrosive and reloadable characteristics. By reloadable, I mean that the primers can be removed and replaced once it’s used up, for your added convenience. 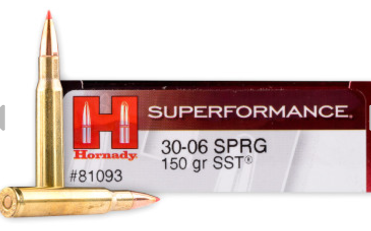 Moreover, this .30-06 Springfield ammunition features the Hornady’s proven and amazing polymer tip design, Super Shock Tip (SST) which comes in handy to allow for your load to shoot flatter, hit harder as well as fly straighter. In other words, the sharp tip of the SST load increases its ballistic coefficient (measure of how well it cuts in air), thereby making it fly faster and deliver more energy when in contact with the target. Upon impact, the tip provides controlled expansion to ensure great expansion, for varying speeds. Not only that, the SST technology features the patented Interlock Ring technology which prevents the separation of the core and jacket, hence ensuring that the bullet retains its mass and energy. Also, it is equipped with 20 rounds per box altogether. The Core-Lokt ammunition line is one of the most popular line from Remington brand. That being said, they are the best line for hunting purposes, especially if you’re targeting medium to large sized games. For your information, the Remington brand is rather famous for decades now, in the ammo industry. Ever heard of the Remington 700 rifle? Ring a bell? If you have, then you should be familiar of how efficient and excellent their products are! Moving on, the Core Lokt design features the tapered copper jacket as well as a solid lead core to ensure perfect and controlled expansion, as well as high weight retention. These factors are very important in order to prevent the core and the jacket from separating upon impact hence producing deeper penetration and an accurate shot. In addition to that, the bullet style is the pointed soft point (PSP) in which it comes with a Spitzer-shaped profile to contribute to a flatter trajectory and improved velocity, hence increasing the chances of you landing an accurate shot. The flat trajectory and excellent velocity is important to ensure that it has deep penetration, which comes in handy especially if you’re targeting larger games. Speaking about velocity, it leaves the muzzle and flies at a velocity of 2690 fps meanwhile its muzzle energy measures 2872 ft lbs in total. Higher energy and velocity, together with heavy bullet weight will lead to a more devastating and accurate result. In this case, it penetrates through the skin of the game well to reach its organs in order to give a quick blow. Moreover, it comes with 20 rounds altogether. These 20 rounds are arranged and packed in an orderly manner to ensure simple and convenient handling and removal, when needed. However, the composition consists of lead metal hence you need to check the rules and regulations of the state before purchasing this ammo. Make sure your area isn’t lead prohibited. Weighing 165 grains, it is of the boxer-primed style (so are most or safe to say, almost all rifle ammunition). The boxer-primed style is rather unique and very popular among the shooters and hunters in the United States because they can be reloadable. In other words, the primers can be replaced when it’s fully used up. My favorite characteristic of American Eagle ammunition is that they are basically versatile. Though mainly used for target shooting or plinking, the .30-06 Springfield ammunition, manufactured by American Eagle is able to be utilized for minimum hunting, well in my case at least. In terms of performance, they fly at a muzzle velocity of 2740 feet per second as well as with muzzle energy of 2500 foot pounds. The theory is rather straightforward where the heavier the bullet, the higher the energy and velocity thereby resulting in a more devastating blow. However, since you’re mainly punching through paper targets, too much penetration is not required. Furthermore, they come in 20 rounds per box altogether. These 20 rounds on the other hand are packed in an orderly manner thereby allowing for easy removal of the rounds, when needed. Or, you can get yourself either a reloader strip or pouch to hold your ammunition securely so you don’t have to bring along the box. That being said, it all depends on your personal preference. The casing on the other hand is boxer-primed so one of the plus point include its reloadable characteristics. In other words, the primer can be removed and replaced once used up, with just a simple pin punch. The casing construction is usually made out of alloy metals so it is guaranteed corrosion-free. Besides that, it is of the full metal jacket type. These type of bullet consists of the alloy jacket covering the entire bullet with only a small amount of exposed lead the base. One good thing about the FMJ type is that it provides deep penetration due to its heavy jacket. Not only that, it provides excellent feeding for a smooth and reliable shooting experience. The common bullet weight for this product are either 150 or 165 grains. Since these ammo are mostly used for deer hunting, they should have heavy bullet weight because it will then result in higher muzzle velocity and energy, hence a more devastating result. It needs enough power to penetrate through the hide and skin of the game, leading to its vital organs for a quick kill. Moving on to the type, there are various types of bullets out there. It all solely depends on your personal preference and what time of game you plan on hunting. It should have a good balance between expansion and penetration, together with a great weight retention to deliver an excellent shot performance with superior accuracy. The boxer-primed style is the most popular priming method in the United States (berdan-style primer for the outside of US) with one of the reasons being that, it is easily reloadable. In other words, the old primers that are used up can be removed and replaced with the new ones, with just a simple pin punch. For your information, the primer functions to ignite the charge inside the cartridge before the shot is fired. In a nutshell, the .30-06 Springfield is rather a solid rifle cartridge that is widely used by many shooting and hunting enthusiasts. Since there are various excellent products to choose from, I hope my review narrows it down for you as well as assists you in making the right choice. Happy hunting and don’t forget to get your very own gun oil.